I’m pretty confident that even a novice chef can make a frittata. In fact, I recently made frittatas with a group of about 20 kids under the age of 12 and they were able to make some delicious frittatas. Two of my favorite parts about frittatas is that you can get creative with your ingredients and a frittata is so great to have in the fridge for any meal of the day. Pick up some of your favorite vegetables, chop and sautée them, whisk some eggs, add some cheese (optional), put it all together and put in the oven for 10 minutes. Incredibly simple. Defrost peas. Chop the other vegetables into small pieces. Sautée vegetables all together in oven-safe pan** with olive oil for about 3 minutes. Add a dash of salt and pepper. **(If you don’t have an oven-safe pan than have an 8×8 baking dish/brownie pan available for later and whatever skillet you have). Meanwhile, whisk eggs with milk in a medium-sized bowl. Add the goat cheese crumbles (as much as you’d prefer) and stir. Add more salt and pepper and add chili flakes. If you have an oven-safe pan, add eggs to veggies and cook on the stove top for about 30 seconds to brown slightly, then place in the oven for 10 minutes. If you don’t have an oven-safe pan, then transfer the veggies and eggs to the baking dish and place in the oven for 10 minutes. Make sure the vegetables are evenly coated with egg. After 10 minutes your frittata should be looking ready to eat. If you’d like it brown a little more then leave it in the oven for a few extra minutes. 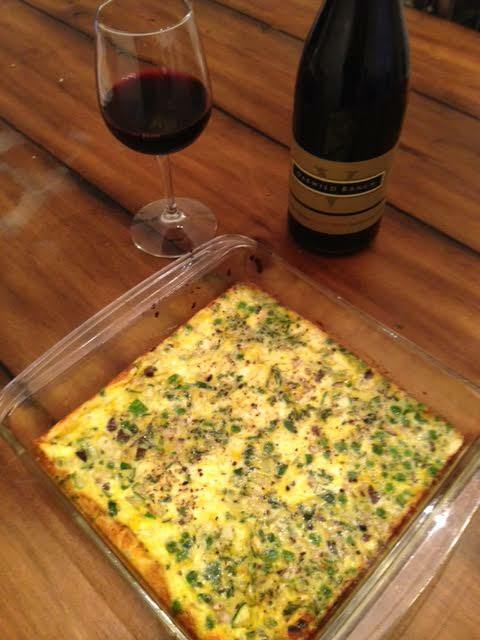 I enjoyed the slim down for 10 days, and now I am adding a few things, and this frittata will be one of the items. I am also reviewing your past posts for other good recipes, etc..